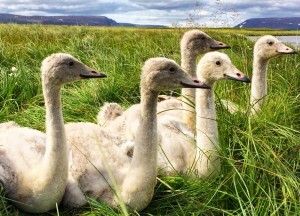 The ringing of Whooper Swans by WWT is undertaken as part of one of WWT’s long-term life-history studies, run in collaboration with Icelandic and Irish colleagues. Ringing in winter is mostly carried out at WWT centres Martin Mere, Caerlaverock and Welney, which have specially-built swan pipes, but the birds are also caught during the annual moult, or as cygnets, on the breeding grounds in Iceland. Kane from the Species Monitoring Unit and WWT’s Head of Media, Sacha Dench, have recently returned from Iceland where they were assisting Sverrir Thorstensen with catching moulting swans and family units in the Mývatnsheiði area of northern Iceland. The team toured known territories to ring family groups, and also caught on lakes that held non-breeding flocks. Whilst the weather was against them most of the time (freezing cold, wet, windy weather – snow at one point too! ), 80 swans were caught in total, consisting of a mixture of newly-ringed birds and recaptures from previous years. Sightings of these birds, which should soon be arriving on the wintering grounds in Britain and Ireland, are gratefully received. Please send details to colourmarkedwildfowl@wwt.org.uk.